Do you need a made to measure door canopy to keep the rain off your door? We can make a bespoke canopy for your doorway. 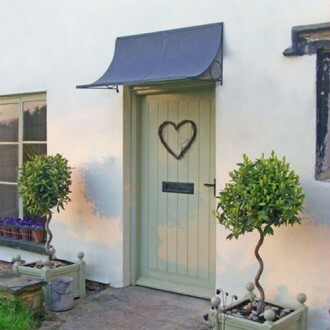 Choose from a range of Scoop or arched door canopy designs in one of our standard sizes, or we can make to measure specifically to fit your doorway. We can also adapt all our canopies to accommodate any architectural features or light fittings that might obstruct the positioning of your door canopy. An over door canopy will also enhance and protect your back door, or choose a wider design for a patio door canopy. Call us with your specifications on 01225 851 577, or email info@garden-requisites.co.uk.